Every so often you pick up a book and before you even realize it the world around you has fallen away, you've been absorbed into the book, your reality no longer exists, and what you hold in your hands has taken over. 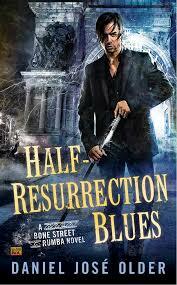 Half-Resurrection Blues is such a book. Daniel Jose Older creates a world so seamlessly overlapping the world as we know it that I lost track of myself as I read. I must admit, I am incredibly slow to jump on the Older bandwagon. I have been buying the books but have not had the chance to sit down and read them. Whew nelly, am I ever kicking myself now. Older is one of those rare authors for me where once I've read something, I want to, need to, seek out everything they've ever published and binge read all the things. Seriously, he is just that good. It is more than just the story/plot. For one, Older manages to layer his imagined world onto our existing one with such a deft touch that I felt I could be looking in on an actual reality. The characters are richly nuanced with depth and personality. You feel connected to these characters and want to know more. I am thankful the other three novels that make up the Bone Street Rumba series are already out because I will be reading them A.S.A.P. Older's writing is without a doubt some of the best from every angle. And this is part of why I am kicking myself for not making his books a priority sooner. His writing transports you in a way not many writers can. You don't feel like you're reading a book, you feel as though you've stepped into the room where things are actually happening. Dialogue is real and reflective of the society we live in. Description is not laborious or distracting. You won't find yourself skimming parts as he's made every word count. I now realize I haven't even mentioned what happens in the book! I am so enamored with the execution and awesomeness of this book I jumped right into telling you why. Carlos Delacruz is a half-dead/half-living agent for the New York Council of the Dead. Delacruz executes the orders of the Council without question until New Year's Eve when he is sent to kill another inbetweener like himself. After killing his target, Carlos begins down a path that will lead to the truth behind his past and the potential residing within himself. It is a truly action-packed ride into a fantasy world you'll happily fall into. Do yourself a favor, go buy this book! Penalties: -1 For you the reader if you haven't bought it already. Nerd Coefficient: 9/10 "A roller coaster ride not to be missed."